SAN FRANCISCO — In an unprecedented move today, Wells Fargo CEO John Stumpf denied entry to hundreds of community shareholders. Having been waiting for hours to attend the corporation’s annual shareholder meeting, the community shareholders were denied entry by Wells Fargo in an attempt to avoid answering questions from community members that had planned to attend the meeting to hold the corporation accountable for its destructive business practices that profit from communities’ losses. Outside the meeting, thousands of people gathered in downtown San Francisco, to confront Wells Fargo executives at the financial institution’s annual shareholder meeting, demanding that Wells Fargo CEO John Stumpf and other executives address the concerns of the 99%. “Wells Fargo’s actions today demonstrate what communities across this country have been experiencing for years: Wells Fargo is indifferent to the havoc they are wreaking in our communities and they do not want to be held accountable,” said Wallace Hill, whose home was foreclosed on by Wells Fargo in Oakland. The 99% activists include a diverse group of shareholders, homeowners facing foreclosure, immigrant rights activists, faith organizations and labor groups from around the country. Protesters will call on the bank to end practices that profit from community losses, including foreclosure, predatory lending, tax dodging, and investment in private prisons. 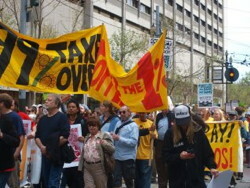 The groups are demanding that the bank halt foreclosure pending investigation and reform, help homeowners by resetting post-bubble mortgages to their fair market values, divest from private prisons and immigrant detention centers, pay its fair share of federal taxes, and end predatory lending practices to individuals and municipalities. Today’s action came on the heels of other significant upsets at Fortune 100 shareholder meetings nationwide: Citigroup (NYSE: C) shareholders’ unprecedented rejection of CEO Vikram Pandit’s exorbitant pay package and tax day protests that saw thousands in the streets angry over the 1% economy and unchecked power of rich corporations, executives shutting down EQT Corp.’s (NYSE: EQT) meeting, executives at Carnival CruiseLines (NYSE: CCL) cutting its live broadcast and two hours of protests and ejections fromthe BNY Mellon (NYSE: BK) meeting. Today’s protest wasn’t the first move by these groups. Earlier this month they met in Des Moines, Iowa, with Jon Campbell, the Wells Fargo executive in charge of social responsibility. Activists presented Campbell with stories of those affected by Wells Fargo’s business practices, then presented a series of requests for how Wells Fargo could change its ways, from principal reduction for underwater homeowners, to halting foreclosures, divesting from private prisons, and paying its fair share of federal taxes. Campbell’s response was a firm “no” to all of the suggestions. The event comes in the midst of a growing national campaign calling for Wells Fargo, which is the nation’s largest mortgage servicer, to provide major new homeowner relief with principal reduction on a scale that approaches the $300 billion in negative home equity that exists in the U.S. Nationwide, there are 11 million homeowners who are “underwater” – and owe more on their mortgage than the value of their homes. Wells Fargo is also a major player in the predatory payday lending industry and has dodged more taxes than any other company since the financial crisis began in 2008, holding back funds that could help put America back to work. Groups working on disparate issues are finding common ground and a common culprit in Wells Fargo in response to corporate America’s continued profiteering and excess in the ongoing financial crisis it helped to create. Groups travelling from many cities have been active recently in a variety of efforts to confront Wells Fargo, including home defenses to resist eviction, tax protests, and direct actions delivering demands directly to Wells Fargo CEO John Stumpf, members of the board of directors and other executives.